The course further aims to equip participants with knowledge and skills to enable them to manage the creation of innovative solutions within a rapidly changing technological, business and social landscape on the one side, and the creation of shareholder value and return on investment (ROI) on the other. 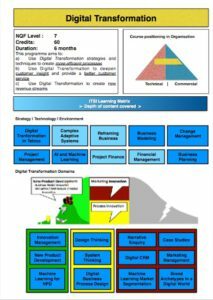 The DTP is designed for current and future leaders within the organisation and aims to create an understanding of the dynamics between the business environment and the integration of digital technology and the role the latter plays in terms of taking the business forward through interaction with customers, both internal and external. The programme therefore focuses on enterprise issues such as digital transformation, distribution channel reframing, innovation, new product development, complexity management, increased customer knowledge through Machine Learning and Narrative Enquiry as well as ICT and enterprise architectural issues. Develop Digital Transformation strategies and techniques that redefine current processes and make them more efficient. Discover Digital Transformation strategies and techniques to obtain, merge and manage a Big Data repository of human and machine data. 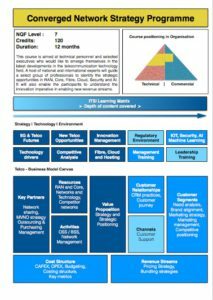 Analyse Digital Transformation strategies and techniques to create and enable a Machine Learning and Artificial Intelligence competence within the organisation. Plan Digital Transformation strategies and techniques to provide a better customer service. Utilise Digital Transformation strategies and techniques to enable new Product Development. Create innovative business ideas to harness the new opportunities made possible by a changing technology, regulatory and social landscape. Facilitate an in-depth understanding of the critical linkages between Machine Learning and increased customer insights. Empower managers with the tools required for the effective management of the Digital Transformation process. Create a new innovation management mind-set based on the Complex Adaptive System ontology. Leveraging your technology infrastructure to open up new revenue streams. The programme focuses firstly on the technologies involved in these networks and secondly on the strategic issues linked to these technologies. The course also focuses managing the relevant business competencies necessary to drive technology and innovation within a very competitive ICT environment. The aim is to build organisational capabilities and employee competence in various fields of Converged Networks. The programme deals with Content and Context. Participants will also be required to do empirical research on (i) implementing new products and services leading to new revenue streams or (ii) on enhancing the value proposition of existing products and services or (iii) on improving client and customer interaction and satisfaction levels. This will be presented, together with a theoretical framework, as a Business Case to the organisation. The programme is accredited at NQF Level 7 with 120 credits allocated. This course is aimed at enabling non-technical managers and executives in a Telco Operator to excel at their task. The course enables executives and managers to obtain critical insights into the latest developments in the strategic, financial, customer service and marketing strategy fields. 2. 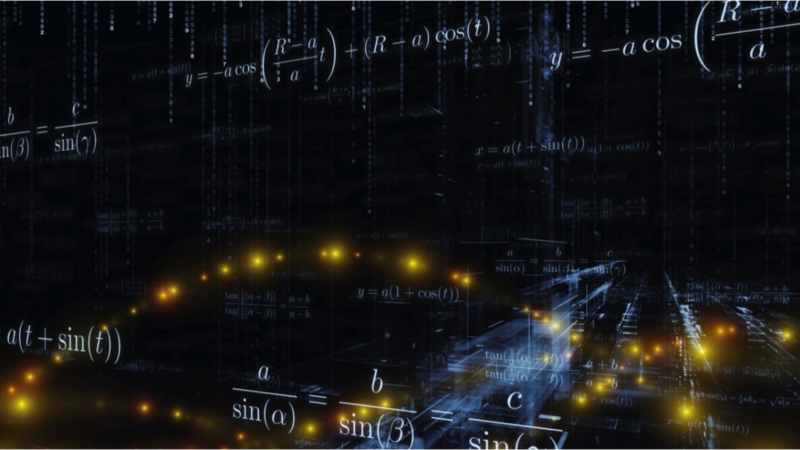 Developing Strategic Value in a Converged World. The programme is accredited at NQF Level 7 with 60 credits allocated. The Programme in Enterprise and Technology Management (PETM) is proposed as part of Management Programmes for furthering the competencies of targeted candidates and improving their ability of accelerated succession planning within the business. It is designed for current and future managers within the telecommunication industry and specifically targeted participants within the organisation and aims to create an understanding of the dynamics between the business environment and the integration of technology and the role the latter plays in terms of taking the business forward. The programme therefore focuses on enterprise issues such as telecommunication business models, finances, human capital (self and others), marketing and customers as well as technology issues. Participants will integrate the theory and practical case studies and apply this to either improving customer service or making the current operational environment more efficient. These practical assignments will build up towards a Business Case that is presented to the organisation towards the end of the programme. The programme outcomes are defined around the two core areas of (i) Technology and (ii) Enterprise (Business). The programme is accredited at NQF Level 6 with 50 credits allocated. 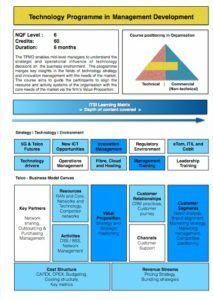 The Technical Programme for Management Development (with specialisation in Technology and Business Management) [TPMD] aims to equip participants with knowledge and skills to enable them to manage the relationship between the technical and technology environments on the one side and customers, shareholder value creation and return on investment (ROI) on the other. 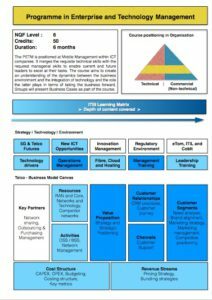 It is designed for current and future leaders within the organisation and aims to create an understanding of the dynamics between the business environment and the integration of technology and the role the latter plays in terms of taking the business forward through interaction with customers, both internal and external. The programme therefore focuses on enterprise issues such as finance, marketing and customers as well as technology and architectural issues. Participants will integrate the learnings and prepare an Action Learning Project (ALP) to be submitted. The programme is accredited at NQF Level 6 with 60 credits allocated.